In Australia The Daily Show with Jon Stewart is broadcast at 710pm Monday to Friday on Free to Air ABC2 digital TV and on the Comedy Channel available to Austar, Optus and Foxtel cable TV customers. 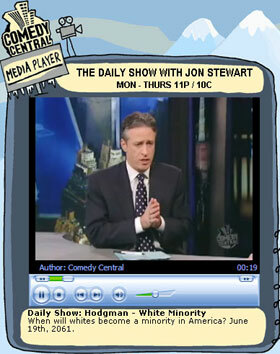 Presented by Jon Stewart, The Daily Show With Jon Stewart delivers smart wit, satire and commentary on current affairs. The Emmy and Peabody Award-winning program takes a reality-based look at news, trends, pop culture, current events, politics, sports and entertainment with an alternative point of view. In each show, presenter Jon Stewart and a team of correspondents comment on the day’s stories, employing actual news footage, taped field pieces, in-studio guests and on-the-spot coverage of important news events. In addition to news stories, the program includes interviews with celebrities, semi-celebrities, authors and political figures. The Emmy and Peabody Award-winning The Daily Show takes a reality-based look at news, trends, pop culture, current events, politics, sports and entertainment with an alternative point of view. In each show anchorman Jon Stewart and a team of correspondents, including Dan Bakkedahl, Jason Jones, John Oliver and Samantha Bee comment on the day’s stories, employing actual news footage, taped field pieces, in-studio guests and on-the-spot coverage of important news events. I am so excited that it is on SBS weekly now! I was addicted to the show when I was living in Montreal and have missed it ever since coming home to Sydney. I watched the Daily Show on Tuesday, and was confused and disappointed when he booked Dennis Miller, then gave him a virtual free pass on his views, all of which are one sided and completely right-wing and pro war in Iraq, never coming to grips with the foibles of the Bush administration. Miller then said that he can’t stand to not have the truth told. I guess that he figures what he leaves out by being only critical of present and past liberals, and for the war is as honest as he can get. I’m disappointed that Jon never once challenged him, and treated him with the utmost kid gloves. Makes you wonder who else gets a free pass, despite their ideology, if they are friends of Jon. Hipsters on the streets of New York are wearing “Stewart/Colbert ’08” T-shirts, promoting a Dream Team presidential ticket featuring the Comedy Central stars. And the subway is plastered with ads for Man of the Year, the new Barry Levinson film that imagines an American public so disgusted with politics that it elects a fake news anchor president. Jon Stewart, host of The Daily Show, insists he’s not running. But judging from the reverential reception he received at last weekend’s New Yorker Festival, and the fact that tickets to his appearance sold out in about two minutes, there’s a hunger for something truthful and authentic in American politics. Man of the Year suggests the place to find it is in fake news. Shame SBS dropped it. “Couldn’t renew their contract”? What a load of baloney. Is anyone else in Australia picking it up? no. SBS are too busy shoveling ads down the throat of a dwindling audience to find the time to show insightful stuff like this. Fortunately we still have the net. EDITOR: yes it was too bad that SBS dumped the Daily Show again. The daily show website is shite, the video delivery stuff doesn’t work properly if at all. Youtube is a good example of delivering video well and the dailyshow website doesn’t do it.